John Muir once famously said, “The mountains are calling, and I must go,” which may be over quoted, but that’s because it’s so, so true. After my first visit to the mountains of Colorado six years ago, they’ve been calling for me ever since. Growing up in the Midwest meant I never knew the joy of the mountains until later in life, but after my first taste, I became obsessed. As we drove across the flatlands of Kansas, the silence in our car was almost unsettling. There were no boys playing their favorite game of “he touched me.” There were no boys asking to stop for food, snacks, bathrooms, or stretching. There were no boys wondering when we’d get there. Unfortunately, there were no boys to point things out to, and no boys to laugh and talk with. We stopped to spend the night at the Goodland KOA, where we had spent the night with our boys six years before, and we looked at the merry-go-round we had once pushed them on. While we were excited to be heading out on our own adventure, it was definitely bittersweet! 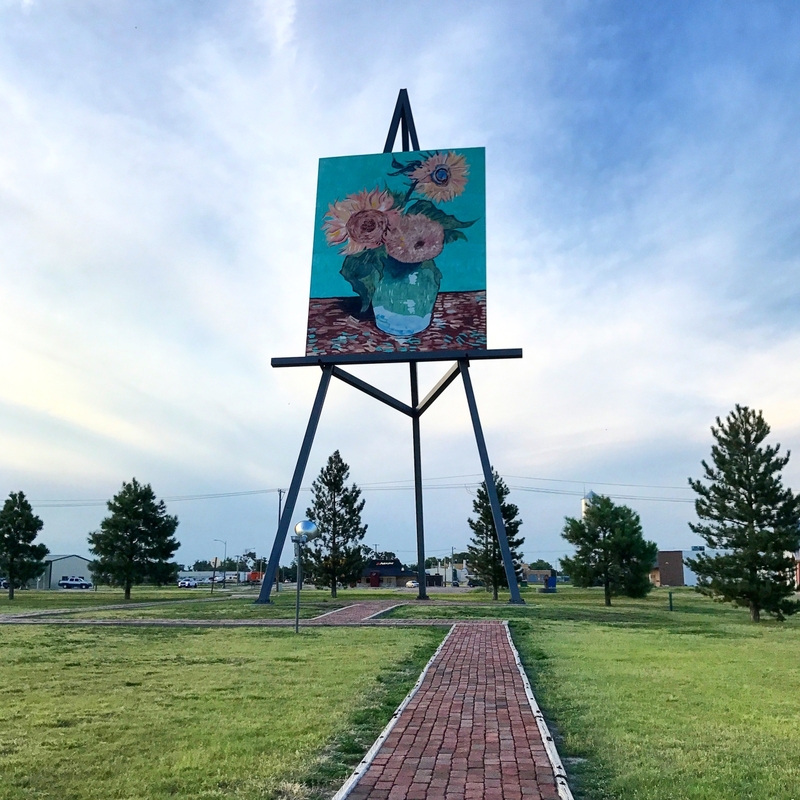 Checking out the World’s Tallest Easel, complete with a reproduction of Van Gogh’s Sunflowers, got me into the vacation spirit. Located approximately an hour west of Colorado Springs, Mueller State Park provides access to great activities both inside and outside of the park. After arriving, we were eager to see what our campsite looked like, and it did not disappoint, even in the drizzly rain. The next morning, we decided to do a short hike led by a park naturalist to learn about the flora, fauna, and terrain. 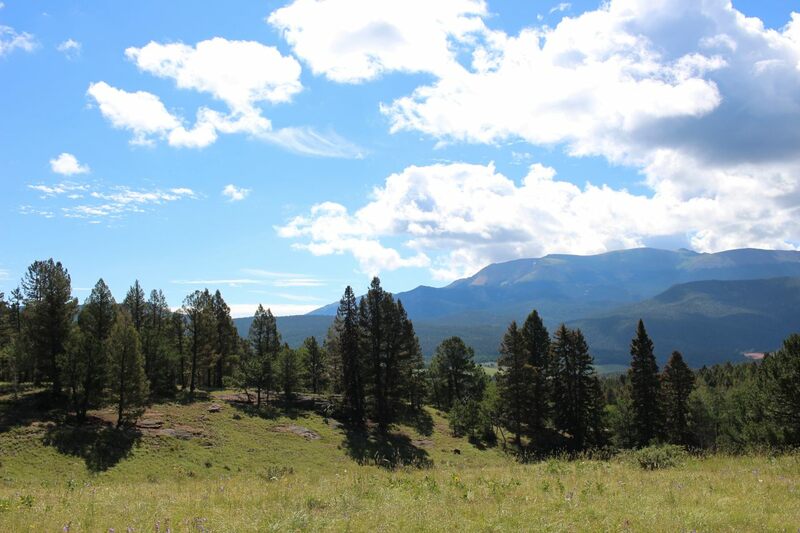 At less than a mile, the Wapiti Nature Trail seemed a perfect choice for us as we were still adjusting to the elevation. For those who have never faced a quick gain in elevation, be aware that you may experience headaches and dizziness, as well as difficulty breathing while hiking. The Wapiti Trail only had a tiny hill, and yet, my heart was pounding, and I couldn’t catch my breath. There’s no place I’d rather be gasping for air than in these beautiful woods. The naturalist stopped to share many tidbits of information along the trail (my husband and I were glad to have the chance to catch our breath as she talked). We learned how to differentiated Spruce and Fir trees with this saying: “square, sharp Spruce; flat, friendly Fir.” On our hike, we saw plenty of both. I happened to be wearing my favorite shirt, which says Stop and Smell the Pine Trees. 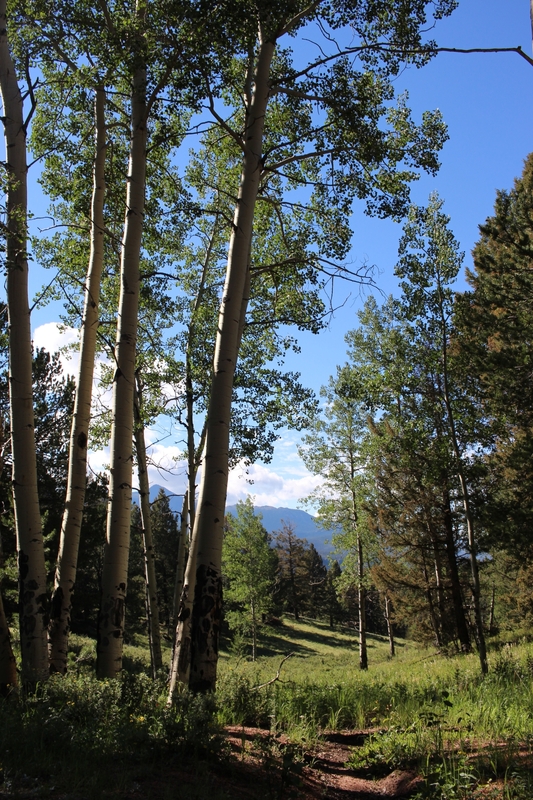 True to my shirt, I put my nose close to the red bark of a Ponderosa Pine to catch a whiff of the vanilla scent. After our short hike on the Wapiti Trail, we were eager to explore more of this beautiful park. Most trails in Mueller go down a ridge and require a hike back up at the end. Thanks to a park ranger’s tip, we learned that the Grouse Mountain Trail is the only one that goes up and then down, which sounded more appealing to us. With the promise of terrific views and an easy hike, we headed out early on our final day in the park. It didn’t take long for the views to wow us. I swear, the skies are bluer in Colorado. The Grouse Mountain trail gently winds through the woods and up the mountainside. 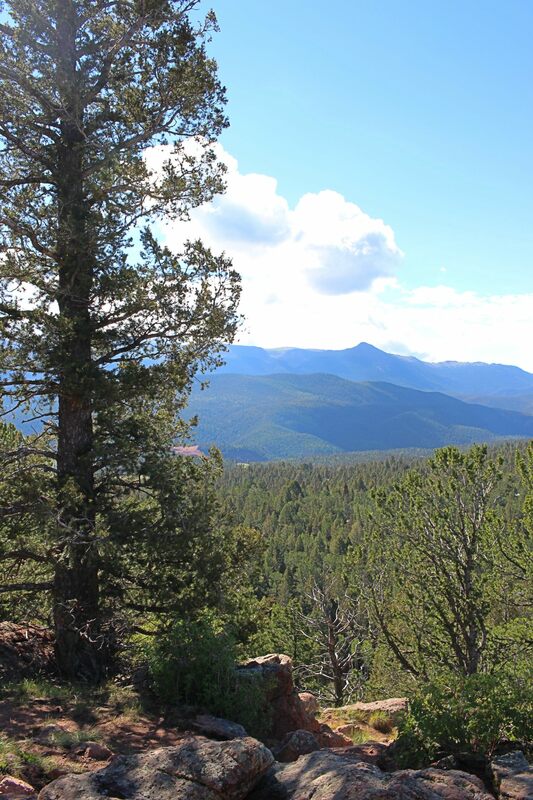 The elevation gain is gradual for much of the trail, with plenty of aspen and pine trees providing shade. We could barely take in all of the beauty and truly felt like we were on top of the world. The Grouse Mountain Trail has a great payoff for the amount of effort. My husband is a fly-fisherman, and I’m interested in learning. 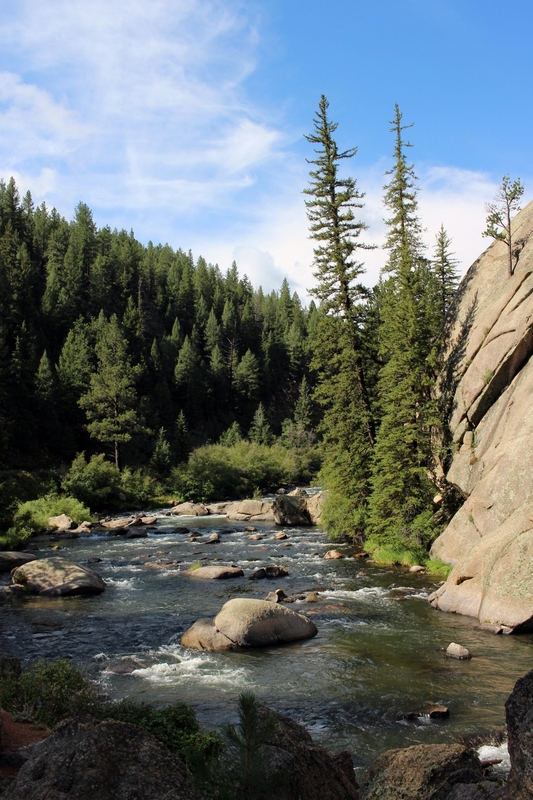 With that in mind, he stopped at a local fly shop to find out the best spots near Mueller State Park. 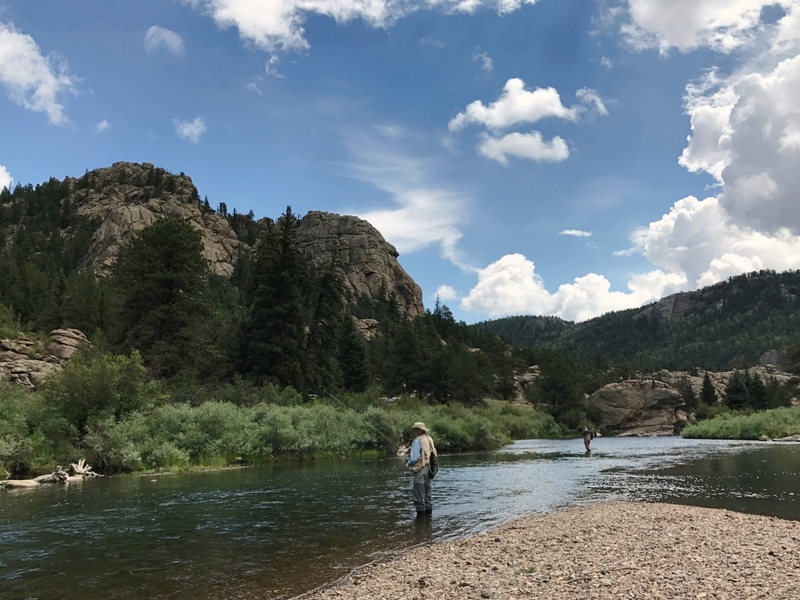 A local fisherman recommend Eleven Mile Canyon, located about 45 minutes from our campsite, near the small town of Lake George. 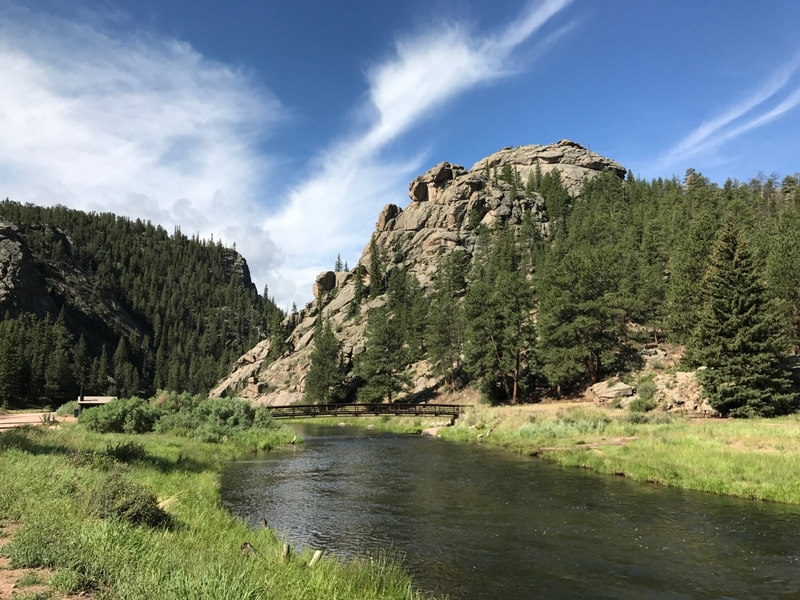 If you visit, you should know there is also an Eleven Mile State Park, which is located at a large reservoir, while Eleven Mile Canyon is located below the reservoir, where the waters of the South Platte River tumble through a dramatic landscape. 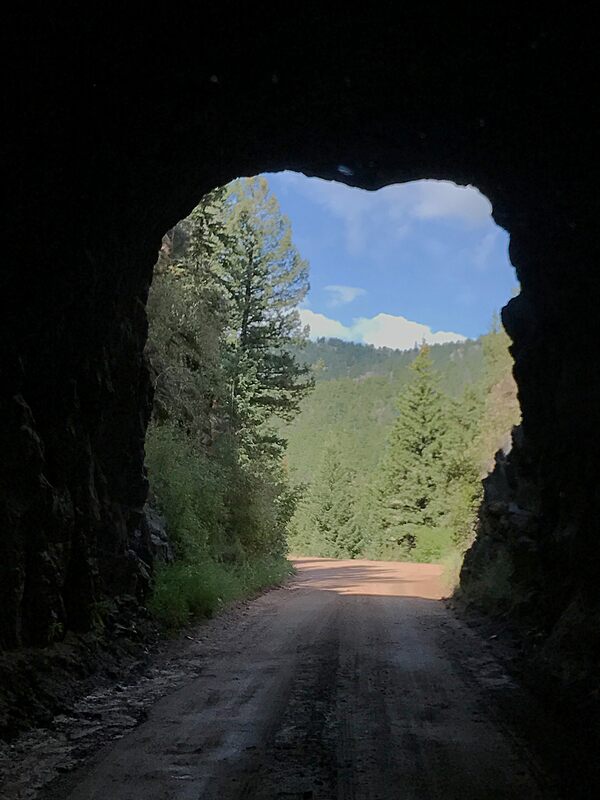 Almost immediately after paying our $7 entry fee, we took a turn on the dirt road that follows the river through the canyon and our view opened up onto the type of stunning scenery one might expect to find in Colorado. 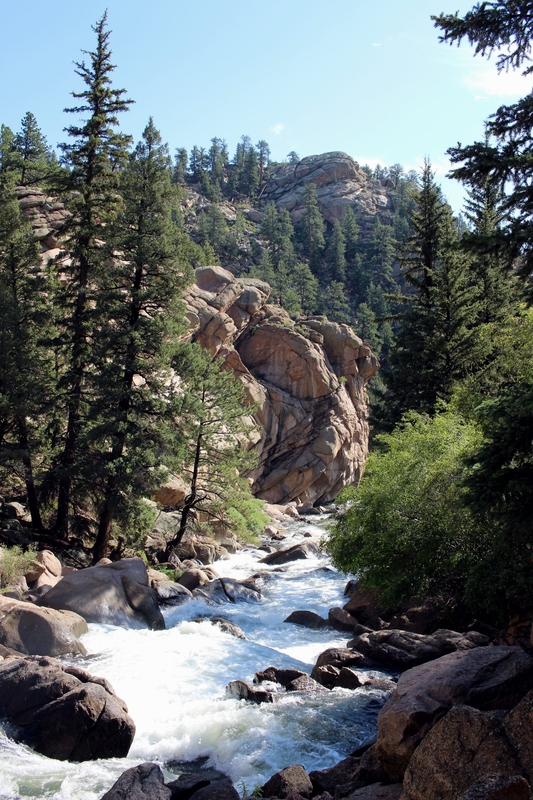 Massive stone boulders rose above the gushing blue waters, with verdant pines and fern adding to the lushness. The sounds of the cascading waters enhanced the ambiance. The winding roadway took us from beautiful scene to beautiful scene. We saw geese and heron on the shores, and beautiful rainbow trouts swimming in the waters. Some turns took us high above the plunging canyon, while others took us right along the shores. The dirt road we were driving on once hosted a different form of transportation. 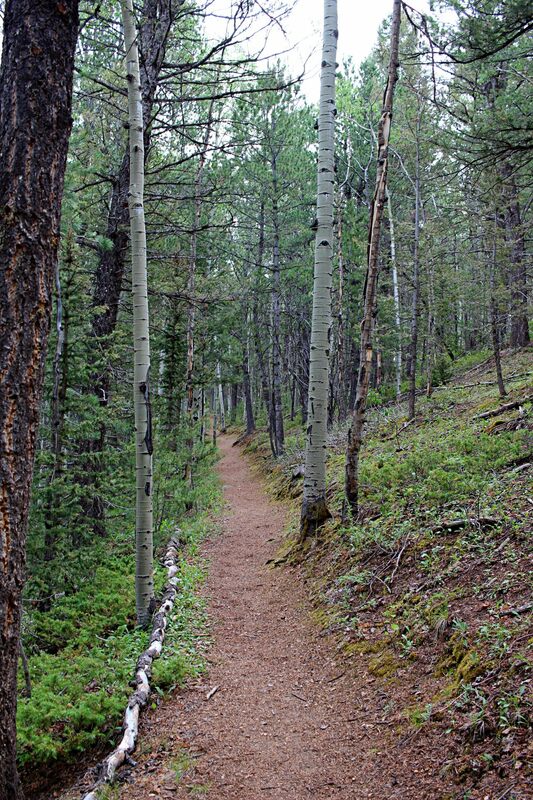 This pathway was forged for the Colorado Midland Railroad in the late 1880s. It’s hard to believe trains once traveled through these tunnels and along this narrow road. After a stunning drive, we opted to fish at the waters just below the dam, where trout are known to hang. Even if we weren’t fishing, this was a great spot to soak in the beauty. I kicked off my shoes and stepped into the clear, chilly waters. A local fishing guide was helping a family nearby and offered us some tips and some flies. Unfortunately, even with his assistance, we didn’t catch anything. The trout bellies were already full for the day, and they were ready to rest in the sunshine. I don’t blame them. Though we didn’t catch any trout, catching the views was all my soul needed. 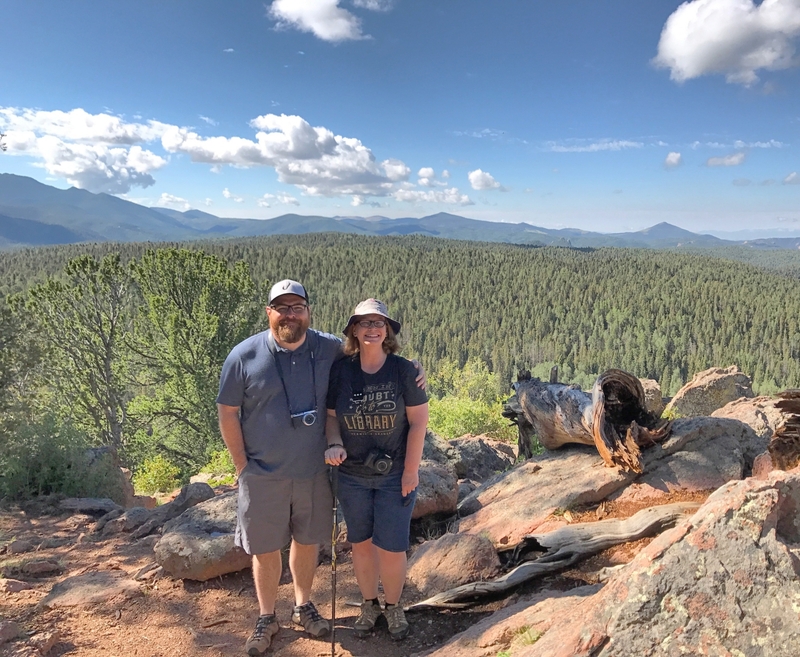 While it rained on us every single day we spent at Mueller State Park, we had an exquisite escape. This year has involved many long teaching days, lots of committee meetings, 4-hour-long night classes once a week, tons of typing, trips across town toting our sons around, and much, much more. Busy is an understatement. 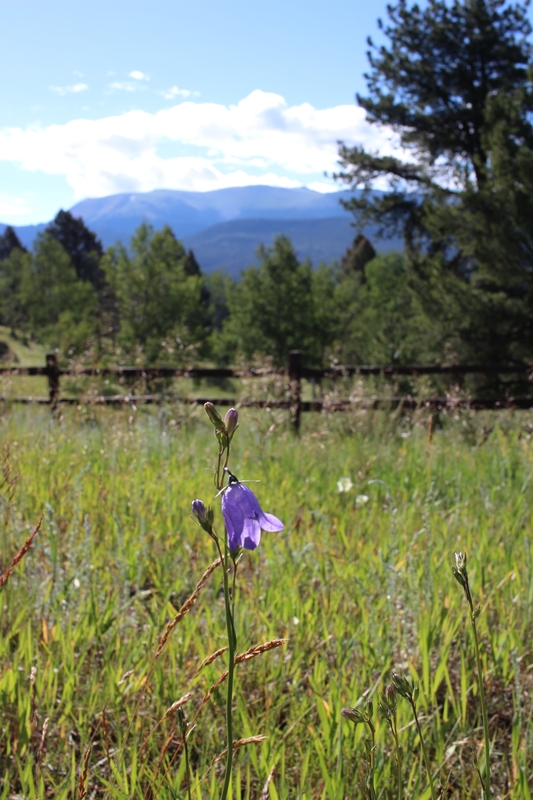 The few days we spent at Mueller were a breath of fresh air, fresh mountain air, to be exact. Posted in: Places We've Explored. 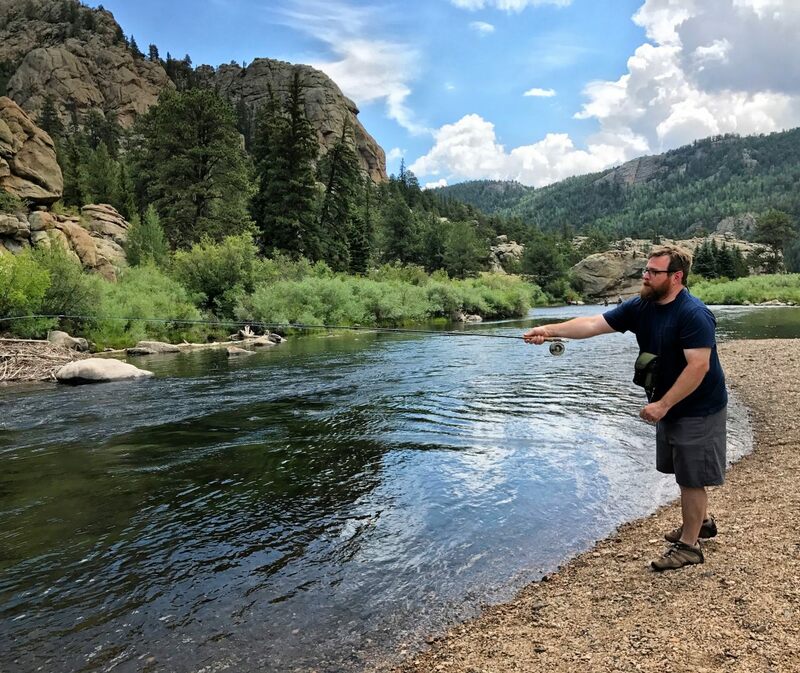 Tags: Colorado, Fishing, Hiking, State parks. Thank you for your kind words! I am so super jealous that the Rockies are a day trip for you!! They’re 12-14 hours from my home. 🙁 My husband has fly fished for decades, and I’ve only started trying to learn. I’m not as dedicated as he is, but it’s definitely a fun activity to enjoy in a beautiful landscape. Have a great time in the mountains!! What beautiful pictures! It sounds like you had a great trip. I look forward to someday taking an adult only camping trip! Thanks, Lara! It was a little surreal the first couple of days without the kids, but we adapted. Thank you! It was such a great getaway. I highly recommend Mueller State Park. Maybe we will take the boys someday! Welcome to my family RV travel blog! My family of four enjoys hitting the road, near and far in our little Jayco travel trailer we call Birdy. Join us to learn about our favorite local places and our cross-country travels. 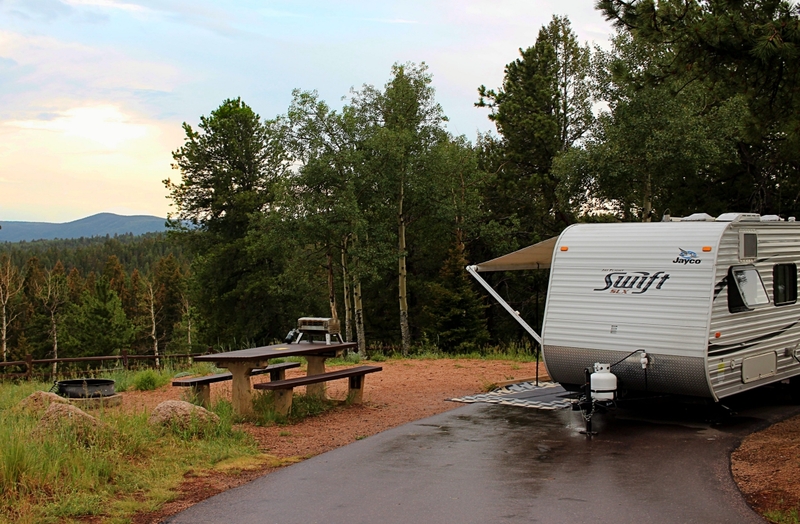 Travels with Birdy shares campground reviews, tips for planning your own RV travels, and recommendations for the best RV products.